Good morning to all you kindergarten teachers out there! I have another fun free kindergarten printable worksheet for you today! To help Tinker Bell with her number writing practice, I created some blank printable seasonal calendar worksheets. How do you use the Monthly Calendar Printables? Each month I pick a new Calendar based on our season, and have her write in the number for each day. I keep the calendar worksheet in her math workbox and so she just adds a new number every morning. On Mondays she adds the numbers for the prior Saturday and Sunday to her page. When that month is completed, we pull out a new month worksheet and start all over! 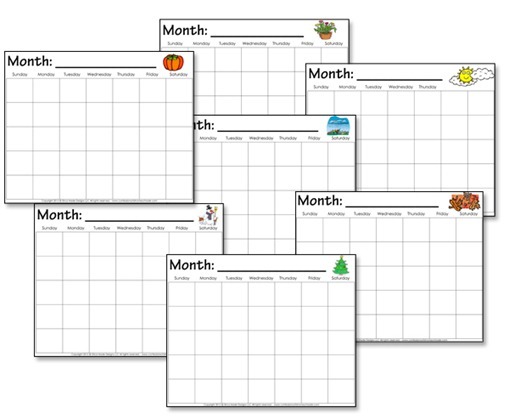 These monthly calendar worksheets great practice writing numbers, counting, and also helps them get used to seeing a calendar, and noting what day today is, what yesterday was, and what tomorrow will be. And even what month of the year it is. I hope you enjoy the Kindergarten Monthly Calendar Worksheets! You always have the most perfect post at the most perfect time for me! I have been searching the past few days for calendars just like this and couldn’t find exactley what I wanted, and then today, here they are! Whether it’s small things like this (however not small to me) or big things, you always say what I need to hear or post something I need! Thank you! This is great! Can’t wait to use it with my kinder in August! Thanks for all you do here for your readers! I get so excited every time I see a new post. if you are tracking the statistics on your site, the increase in clicks or views are all me. I am going over your site over and over trying to read every article and download every printable. Thank you so much! Thank you. I have printed the calendar sheets, and they are wonderful. Thank you so much for sharing. Last week I printed off the number mazes for my 7 year old son who just finished 1st grade homeschool. I took 2 of these pages to church for him to do. He loved them! Then he drew pictures and words on the back including “I want FOOD.” It was the evening service and it was going over. Thank you for the printables. They are great! Thanks, I’ll take a look at them and make sure to get it fixed. Oh yep, you’re correct, I just uploaded a fixed version, thanks for letting me know! Oh my goodness! These are fantastic! Thank you so much! You are one amazing lady and a huge blessing! Thank you so much for all worksheets. I just love your worksheets. They are gorgeous. Thank you! I’ll use these with my kindergartener. Thanks so much Erica, I needed some calendars and why not have the kids do number practice. I’ve downloaded this and will be using it! Thanks so much.